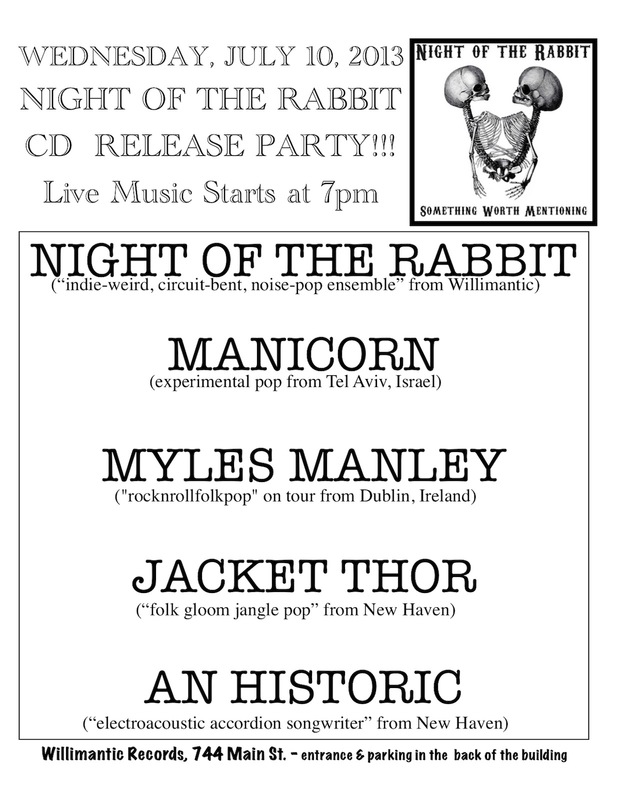 Willimantic Records: NIGHT OF THE RABBIT have a new cd. See them at Willimantic Records on July 10th with MANICORN, MYLES MANLEY, JACKET THOR and AN HISTORIC. NIGHT OF THE RABBIT have a new cd. See them at Willimantic Records on July 10th with MANICORN, MYLES MANLEY, JACKET THOR and AN HISTORIC. Night of the Rabbit’s new cd comes out on July 10. Come buy a copy and watch them play live along with Manicorn, Myles Manley, Jacket Thor, and An Historic. Music starts promptly at 7pm. All shows are free with donations to the musicians encouraged.